I certainly do love a juicy burger with a soft fluffly bun to go with it. There is nothing worst than eating a bun that is hard and thick and with a meat patty that is dry and tasteless. I think this would be an absolute sin! 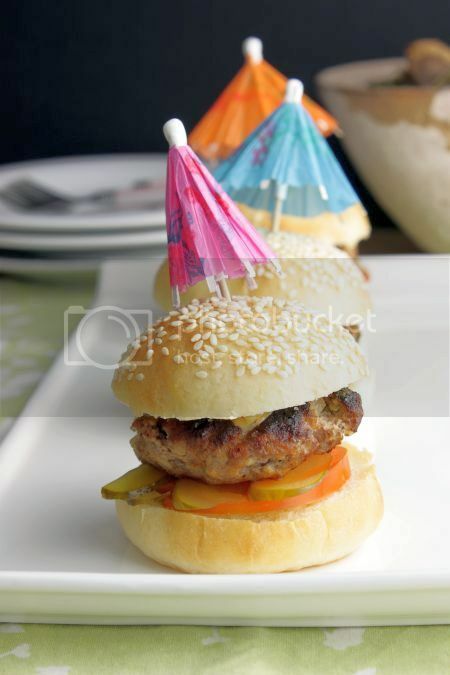 This particular burger bun recipe comes from Grace of Kitchen Corner . I had the priviledge to sample this when I attended a bloggers meetup and Grace had kindly contributed her burgers as part of the scrumptious feast we had. After the first bite I knew I had to try my hand at making them. So it was a few weeks after that (ok I know ... this is a very late post) that I set one Sunday to make them from scratch, and this including the meat patty as well. By the way, this is also the first time I am making bread using the "water roux" method. This particular recipe makes for 8 normal sized burger buns. 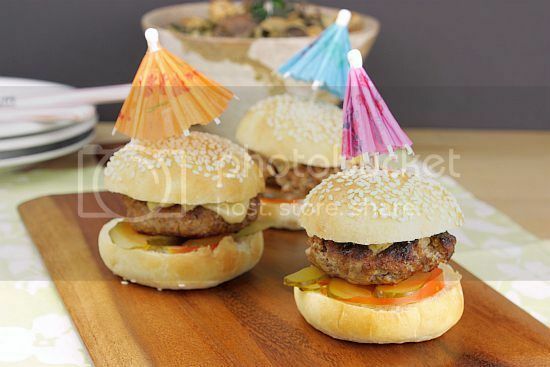 However I decided to go for mini sliders instead .. guess this is the rage right now. I ended up with about 15 mini burger buns. I followed Grace's tip as well which was to make the buns first. After they are baked, I could then judge the size of meat patties I had to make thereafter. Cook 125g water with 25g bread flour at medium low heat, keep stirring until it become thicken and no lumps left. If you've a candy thermometer, measure it until the temperature turn to 65C then turn of the heat. If you don't have one, cook it until it is like baby porridge consistency. Transfer to a clean bowl to cool down. 1) Place all the ingredients for kneading except the butter until everything come together and become a smooth dough then add in the butter a little at a time. 2) Let the dough slowly absorb the butter then turn to speed two if you are using kitchenaid mixer. Knead until the dough no more sticking at the side of the mixing bowl and the dough should be very smooth and elastic. 3) Let it proof for 40 minutes in a clean bowl cover with cling warp. 4) Divide the dough into even size of 8 portions or any size you like it to be then let it rest for 10 minutes. 5) Shape the dough into smooth round shape. Prepare some water on a a clean plate and place a kitchen towel on the top. 1) Mix together ground round, beaten eggs, onions, soda crackers, garlic, salt, pepper and barbecue sauce. Mix until well incorporated. Leave in the fridge for about half an hour. 2) Remove from fridge and divide into 8 equal sized patties. 3) In a frying pan over medium-high heat, heat olive oil. Cook untill desired doness. These burger buns look very pretty and perfectly soft. 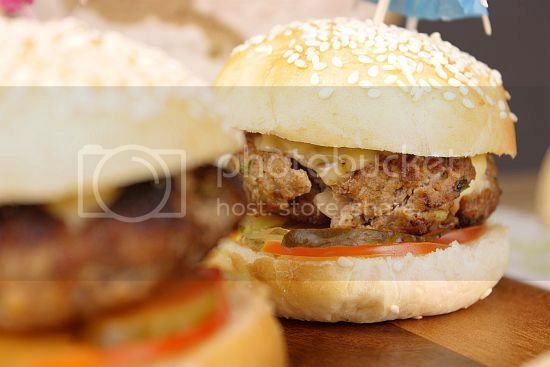 Beautiful looking buns and cute little burgers :)! Thanks for trying out the recipe! I hope you like it. There looks very pretty! Jo, you are motivating me on. Been eyeing on this one but just too lazy to do it. I am sure my kids will be delighted. Push me harder. Small is cute! They are so easy to eat! Yum! Jo, you are reminding me on how tasty is the burger, I miss it so much, yum yum! Wow Jo, you've been on a roll and I have been missing out on all your good eats! Your burgers look exquisite! You made it look so easy! Grace would be proud. home made burgers right down to the buns! how awesome! looks good!! Jo, we were indeed fortunate to have been able to try Grace's sliders! (Hey, I learned a new term from you!) I didn't know sliders are all the rage now. Is it just in SG? So, when will I get to try yours? Yours look just as good! Do you like the tangzhong/water roux method? 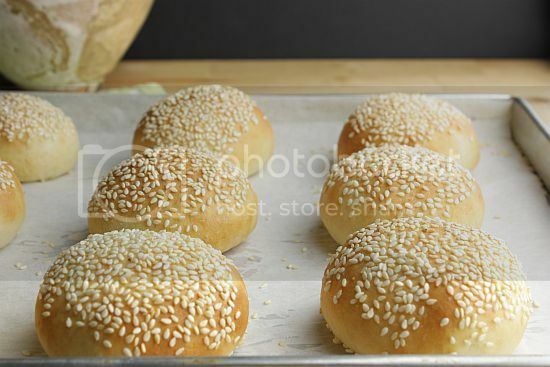 I can't believe you made these hamburger buns. They look absolutely amazing! So pretty! I have to try making my own buns next time! I've shortlisted the same recipe but yet to give it a try. Yours look absolutely delish!